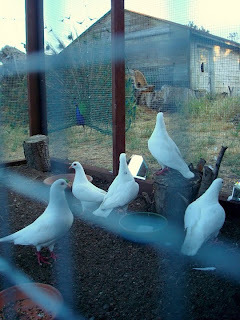 On 7/20, I (MickaCoo) received an e-mail from San Jose Animal Care & Services saying that they had an ink-marked king pigeon they were hoping we could take. I and the few fosters I have were full up and I asked them to hold him, for two weeks if possible, as there were some adoptions in the works. At around 3pm on Thursday, 7/23, I received the message that he had an injured leg and had run out of time and, if we couldn't take him, he'd be euthanized. I posted this desperate news to the Mickaboo Discussion Group and within a few minutes, Mickaboomers Sherri said she'd foster him and Gabriella rushed to the shelter to pick him up and race him to For the Birds avian vet. Gabriella named him Peppermint because of his candy cane coloring. He spent the night there, was examined and on Friday night, caught a ride north from San Jose to me with vet tech (and my friend and bird sitter), Jennifer. Whenever I get a new king, I start out mad at them. I know it's not their fault that they're in dire straights and that I'm overwhelmed with pigeon rescue night and day and I certainly don't take it out on them but let's just say I'm past the point of feeling, "Oh, another pigeon... how nice." Instead it's more like, "Crap." And so I pull Peppermint out of his transport box and this poor bird, marked up by some crazy person with permanent magic marker, is sick as hell (white blood count is 63K), has multiple leg injuries and is just a baby- about 4 to 5 weeks old. And he's a perfect sweetie. I pet his head and he closes his eyes and relaxes, happy just to have a little comfort from what must have been a pretty crummy world most of his whole, short life. The next day, I have to give him a shot (PMV vaccination), two terrible tasting medicines (wormer & antibiotic), and I bathe the first layer of filth off of him (though it doesn't touch the magic marker). Despite all these traumas, he completely forgives me and welcomes more snuggling after I'm through. He must think I'm a real Dr. Jekyll and Mr. Hyde. Peppermint has turned a real corner though- he's ensconced in the incredibly gentle and dedicated foster care of Sherri and Bill Ness now. They've furnished his crate with a new towel and heating pad, they cuddle him, arrange his food and water dishes just so to shorten his painful commute on a probably fractured leg, hand feed him extra tidbits, medicate him, clean up after his projectile diarrhea. This baby is finally safe, protected and loved. Eventually, he'll molt in nice new white feathers and his illnesses and injuries should resolve with all the care he's finally getting. He's going to make somebody an incredibly sweet pet. Peppermint has been saved. 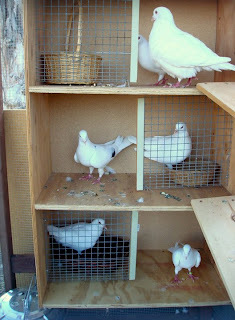 Peppermint, an abused and sick baby king pigeon that MickaCoo took in from the San Jose Animal Care is doing great! He came in with infections in both legs (among other problems) and his right knee joint was so destroyed that he couldn't put any weight on it and the vet didn't think it would ever be viable. Now he can not only stand on it but can walk and has even stood with all his weight on it when he wanted to give himself a scratch with his left foot. He's really bonded to his MickaCoo foster mom, Sherri, and draws a lot of comfort and confidence from her. I was surprised, when I went to visit them on 8/15, to see how babyish his behavior is. When I had him for 24 hours about 3 weeks ago, he was very reserved and stoic. Now that he's safe and comfortable and getting healthy and feeling loved, he's much more expressive. He loves to kiss his reflection in the mirror, gives little baby squeaks and plays nibble games with Sherri's shirt edge. And, he's the Bay Area Birds Yahoo Group Bird of the Month! You can make a tax-deductible donation to help pay the vet bills for Peppermint by going here. Please include the word "Peppermint" or "pigeon". Click here for the latest story on Peppermint and word from his foster mom, Sherri. Someday maybe I'll have a chance to write about everything Peppermint's been doing these past three years (including his first marriage to older pigeon woman and true MickaCoogar Detroit, as well as his second to voluptuous Sparkle) but for now, let me just say that he and his third wife, young Skylar, have been ADOPTED and now live with four other very lucky pigeons in a custom-made aviary in Sonoma! Skylar (standing) and Peppermint (sitting on their fake eggs) wait patiently for their new home to be ready. Congratulations, Peppermint! You are HOME! What an incredible story Elizabeth,good job by the Mickacoo volunteers! I found this webpage from the email you sent. It doesnt say here he needed $2000 of medical care to get well. Good for everyone involved. What a fantastic animal.